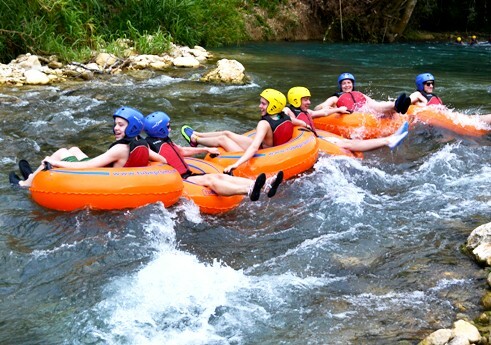 This one of a kind, family friendly, wet and wild River Tubing Safari and Dunns River Falls adventure begins directly from the Montego Bay cruise ship port or Montego Bay/Rosehall resort. Journey on a scenic and informative drive to the historic Rio Bueno River, discovered and named the "Good River" by Christopher Columbus and the Spanish in 1494. Put on your safety equipment and receive safety instructions from your trained guide. 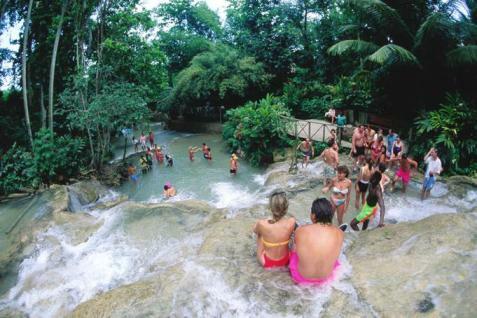 Follow your guide across the swaying "Irie Bridge" for a short hike through the cool rainforest along the riverbank while observing various species of vegetation to the starting point of your Montego Bay Jamaica River Tubing adventure. Enter the refreshing waters of the Rio Bueno to begin your exciting river tubing journey downstream to the midway stop under the giant bamboo tree. Swing on the rope into the clear placid river pool. 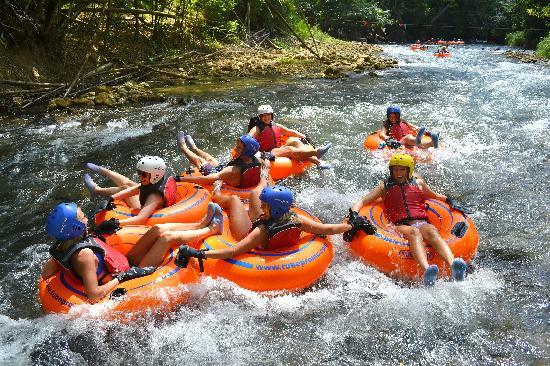 Jump back into your tube while the currents of the Rio Bueno carries you through lush tropical greenery while taking in the amazing scenery as you float to the Caribbean Sea into the sandy shores of “Bengal Bay”. Take a short walk along the shoreline as the sand hugs your feet and caresses your toes before arriving at the Bengal Beach; have a cool refreshing drink at the bamboo bar, take a swim in the warm ocean water or just relax before your driver takes you on a scenic sightseeing drive along the north coast to Ocho Rios Dunns River Falls. 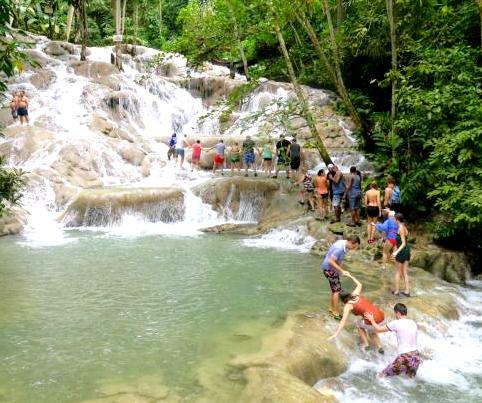 Visit world famous Dunn’s River Falls, a 600-foot high waterfall cascading over smooth boulders. 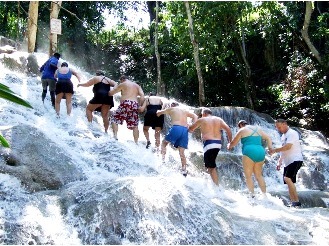 An experienced guide will lead your climb up the spectacular waterfalls. If you do not wish to make the entire climb, you may choose to relax in one of the naturally formed freshwater pools and enjoy the refreshing waters. * Tour order may vary! * 1 to 3 persons...please Contact us for rates! Excellent Trip, the family/kids had a blast. Driver, guides all super friendly and this is a trip the whole family would do again. 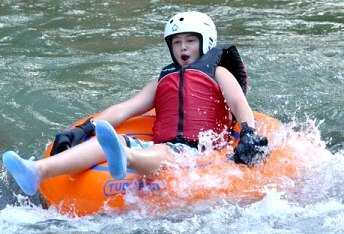 We had a great time tubing the Rio Bueno. The guides were very friendly and so was our driver. Thank you jaital for making our short trip absolutely fun!!! Just a quick note to let you know that our experience with Jaital was very positive. Our driver was kind and knowledgeable, and our experience on the Rio Bueno tube ride was memorable. we would recommend Jaital to our friends.